Objective Cardiovascular disease (CVD) is a leading cause of morbidity and mortality globally, and prevention of CVD is a public health priority. This paper aims to describe the perspectives of general practitioners (GPs) on the prevention of CVD across different contexts. Design Systematic review and thematic synthesis of qualitative studies using the Enhancing Transparency of Reporting the Synthesis of Qualitative research (ENTREQ) framework. Data sources MEDLINE, Embase, PsycINFO and CINAHL from database inception to April 2018. Eligibility criteria for selecting studies We included qualitative studies on the perspectives of GPs on CVD prevention. Data extraction and synthesis We used HyperRESEARCH to code the primary papers and identified themes. Results We selected 34 studies involving 1223 participants across nine countries. 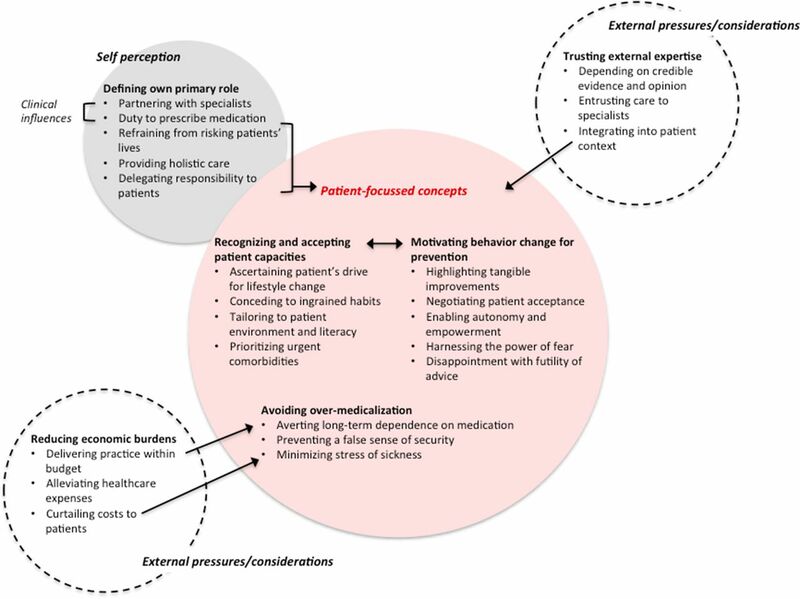 We identified six themes: defining own primary role (duty to prescribe medication, refraining from risking patients’ lives, mediating between patients and specialists, delegating responsibility to patients, providing holistic care); trusting external expertise (depending on credible evidence and opinion, entrusting care to other health professionals, integrating into patient context); motivating behavioural change for prevention (highlighting tangible improvements, negotiating patient acceptance, enabling autonomy and empowerment, harnessing the power of fear, disappointment with futility of advice); recognising and accepting patient capacities (ascertaining patient’s drive for lifestyle change, conceding to ingrained habits, prioritising urgent comorbidities, tailoring to patient environment and literacy); avoiding overmedicalisation (averting long-term dependence on medications, preventing a false sense of security, minimising stress of sickness) and minimising economic burdens (avoiding unjustified costs to patients, delivering practice within budget, alleviating healthcare expenses). Conclusions GPs sought to empower patients to prevent CVD, but consideration of patients’ individual factors was challenging. Community-based strategies for assessing CVD risk involving other health professionals, and decision aids that address the individuality of the patient’s health and environment, may support GPs in their decisions regarding CVD prevention. Qualitative studies conducted in range of settings and populations were synthesised to generate a more comprehensive understanding of decision-making and approaches to cardiovascular disease prevention among general practitioners. Some studies did not specify whether an absolute risk assessment or individual risk factor approach was used, and differences between perspectives on primary and secondary prevention were unclear. Non-English articles were excluded, which may limit the transferability of the study’s findings. While these shortfalls are likely to be due to many factors5 13 including challenges in managing diverse patient populations and variability in patient motivation,14 more detailed data on why this occurs at the healthcare provider level are limited, hindering practical strategies for improvement. General practitioners (GPs) play a key role in assessment and management of CVD risk and qualitative studies have elucidated their perspectives on primary and secondary prevention of CVD. A synthesis of qualitative studies can generate a more comprehensive understanding of the reasons for decisions and approaches to CVD prevention across different settings and populations in primary care. We aimed to describe the spectrum of GP perspectives to inform strategies that may address concerns, uncertainties and the challenges in CVD prevention, to support decisions and implementation of evidence-based strategies for the prevention of CVD and improved healthcare outcomes. The reporting of this study follows the Enhancing Transparency of Reporting the Synthesis of Qualitative research (ENTREQ) framework15 and the PRISMA (Preferred Reporting Items for Systematic Reviews and Meta-Analyses) checklist16 (online supplementary file 1). Qualitative studies on the perspectives of GPs regarding the primary and secondary prevention of CVD were eligible for inclusion. GPs were defined as physicians who assumed responsibility for providing ‘continuing and comprehensive medical care to individuals, families and communities’17 and included primary care physicians and family practitioners. Studies published in peer-reviewed journals and doctoral dissertations were included. We excluded quantitative surveys, epidemiological studies (eg, randomised trials), non-primary research articles (eg, reviews), clinical guidelines, economic studies and non-English articles to minimise misinterpretation in translation. We used a sensitive search strategy, which is provided in online supplementary file 2. Searches were conducted in MEDLINE, Embase, PsycINFO and CINAHL from database inception to 15 April 2018. We searched the ProQuest Dissertation and Thesis database, British Library Electronic Digital Thesis Online Service and the Europe E-theses Portal for doctoral dissertations. Primary care journals, Google Scholar and reference lists of included studies were also searched. Titles and abstracts were screened by IJ who excluded studies that did not meet the inclusion criteria. The full texts of the remaining articles were assessed for eligibility. To evaluate comprehensiveness and transparency of reporting in each study, we used the COREQ (Consolidated Criteria for Reporting Qualitative Health Research). The framework included reporting items specific to the research team, study methods, context of the study, analysis and interpretations. Three reviewers (IJ, AJ and CSH) independently assessed each study, and any inconsistencies were resolved by discussion. Using thematic synthesis,18 we entered all the participant quotations and text from the ‘Results’ section of each paper into the software HyperRESEARCH (version 3.0.3; ResearchWare, Randolph, Massachusetts, USA) to code the data. Author IJ read each article line-by-line and coded text into inductively derived concepts that reflected GPs’ perspectives on the prevention of CVD. Author IJ translated concepts within and across studies by interpreting the data from the primary studies and coded text to existing concepts (that had been identified in previous studies), or by creating a new concept (that was not identified in previous studies) when necessary. Similar concepts were grouped into themes. The preliminary themes were discussed with the research team (AJ, AT) who also read the included studies. This form of investigator triangulation ensures that the full range and depth of data reported in the original studies are captured in the analysis. We identified conceptual links and developed a thematic schema. We cross-tabulated the themes with primary and secondary prevention strategies for CVD (eg, medications, lifestyle or behavioural change, risk assessment tools and service delivery models). Patients were not directly involved in this systematic review of GPs’ perspectives on prevention of CVD. Of the 7405 articles identified in the search, we included 34 studies, involving more than 1223 GPs (one study did not report the number of participants, figure 1). The characteristics of the studies are provided in table 1. Across the studies, interviews, focus groups and questionnaires with open-ended questions were used to collect the data. Search results. CVD, cardiovascular disease; GP, general practitioner; QOL, quality of life. The comprehensiveness of reporting varied, with studies addressing 6 to 19 of the 24 criteria for reporting of qualitative studies (table 2). The participant selection strategy and the participant characteristics were reported in all 34 (100%) studies. The duration and the venue of data collection was specified in 20 (59%) and 10 (29%) studies, respectively. Twenty-eight (82%) studies reported researcher triangulation, and 17 (50%) studies reported on their use of software to facilitate data analysis. Quotations were provided in 30 (88%) studies. 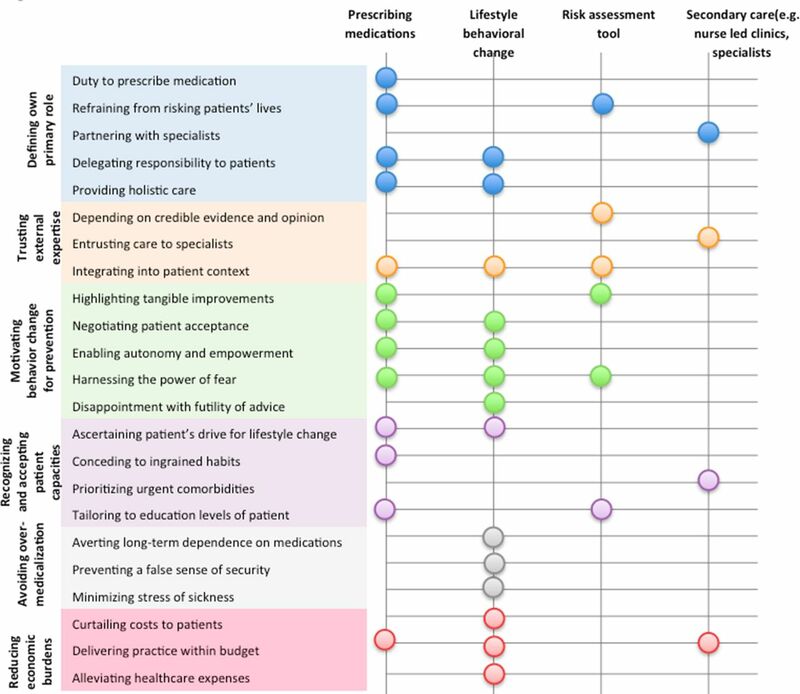 We identified six themes: defining own primary role; trusting external expertise; motivating behavioural change for prevention; recognising and accepting patient capacities; avoiding medicalisation and minimising economic burdens. Selected quotations for each theme are provided in table 3. The relationships among themes are shown in figure 2. Figure 3 shows a matrix of the themes that related to each CVD prevention strategy. Most studies did not specify if perspectives related to primary or secondary prevention or a specific population (eg, high risk); however where possible, these have been delineated in the synthesis. Matrix of prevention strategies and themes. As patients at high risk of CVD often had comorbidities, some GPs ‘co-managed’21 their patients with specialists. ‘Working together’21 with specialists meant reinforcing, to the patient, the specialist’s advice and GPs believed that this would strengthen cohesive care for the patient. Some GPs emphasised their desire to take on a generalist role by providing comprehensive care and being ‘carers for the total patient,’ which included taking responsibility for lifestyle, nutrition education and prescribing medicine. Some GPs considered that this also involved ‘creating a positive expectation’,20 enabling the patient to feel optimistic about the preventive strategy outcomes, which was important for patient motivation. Educating patients about diet and nutrition to prevent CVD was regarded by some as being ‘outside their interest and expertise’23 and believed that dieticians or other clinicians were better able to inform patients about lifestyle changes. Some GPs were enthusiastic about a team-based approach to prevention involving trained practice nurses and lifestyle advisors due to time constraints in their own consultations.26 For patients with comorbidities, some GPs considered specialists (eg, psychiatrists, cardiologists) to have more authority in educating their patients, as they had better knowledge of the patient’s condition and medication. Some GPs considered the patient’s family history and background when determining prevention strategies. They advocated the use of ‘human judgement,’ which incorporated ‘emotional, political and logistical’19 considerations rather than accepting risk scores unconditionally. Others were unwilling to use risk scores to estimate pretreatment risk due to ambiguity of current guidelines regarding unique patient circumstances. When developing a strategy for preventing CVD, some GPs perceived that compromise was necessary in encouraging patients to cooperate. An explicit discussion and consideration of the patient’s goals and priorities was seen to encourage patients to ‘work with the doctor, not against the doctor’28 which built trust. Some GPs coproduced a strategy with the patient that was feasible for the patient’s own situation. Some GPs noted that patients with a lower risk of CVD were highly anxious about their risk factors and responded by giving patients reassurance and control over their medication and lifestyle prevention strategies. GPs perceived that patients who had a sense of autonomy and empowerment over their bodies felt more secure and willing to manage their risk factors. Some GPs felt they had to be realistic about their patients’ desires to modify their daily lives, including changes to diet, physical activity and commencing a medication regimen. When patients seemed unwilling, GPs refrained from encouraging lifestyle changes or prescribing drugs to save their own time and resources. Some GPs believed that patients who had established long-term lifestyle patterns in life (particularly patients who were obese and elderly) were unlikely to alter their habits (eg, smoking, diet), and so did not encourage lifestyle changes. They concluded that ‘medications are the only hope’30 for patients who they believed were unable to adopt preventive behaviours. In patients with comorbidities (eg, diabetes, mental illness), some GPs chose to delay prescribing strategies for CVD prevention to minimise the stress in patients of having to contend with multiple treatments. They focused on the patient’s primary condition until they felt that the patient was emotionally and mentally prepared to discuss CVD prevention. For patients on medication for another disease, GPs were hesitant to prescribe more medication as they expected that the complexities of polypharmacy reduced overall adherence. Some GPs were concerned that most patients would be inclined to opt for medications as an immediate and easy solution, rather than make lifestyle changes. This was attributed to the marketing and widespread advertising of medications in the general public. They believed that giving young patients or patients who were not at high risk a lifetime prescription of medicine for preventive purposes should be avoided by encouraging lifestyle changes instead, to prevent a dependence on medications when it was not absolutely necessary. Some GPs especially in low socioeconomic regions like Guatemala were mindful of the economic burden of long-term medication on patients and thus prescribed medications only for patients at high risk as determined by their cholesterol or blood pressure. Some were also conscious and expressed concerns about the commercial interests of pharmaceutical companies—‘95% of treatment with statins is wasted’ and ‘fuelled by the interests of the pharmaceutical industry’.22 However, others believed in the long-term cost-effectiveness of preventive medicine in minimising the potential for incurring costs for treatment of CVD. Some GPs in studies conducted in the UK and New Zealand were careful not to exceed their budget for drug prescriptions, and they were conscious of the limitations of funding available for their practice, which contended with external pressures (from pharmaceutical companies, health advertising) to offer drug treatment. GPs were more inclined to prescribe medicine for secondary prevention of CVD or for primary prevention in patients with a high risk of CVD to ensure an adequate budget for other patients in their practice. Primary care healthcare providers believed that patients needed to be empowered to continue with medications and be motivated to make lifestyle changes for the prevention of CVD, but were challenged by the complexities of considering the patient’s cognitive capacities, practical circumstances and health status. Some articulated a professional and ethical duty, to prescribe medications for the prevention of CVD and subsequently minimise the risk of future CVD events that could be preventable, and to avoid taking any responsibility for risking the patients’ lives. However, some had concerns about prescribing patients long-term medications, particularly in the context of primary prevention and among patients who were not deemed to be at high risk of CVD. Providers considered preventive strategies in the context of tensions between respecting patient autonomy and being too intrusive and paternalistic in recommending behavioural change. In making decisions about prescribing medication therapy, they considered the economic impact on their local practice (particularly in the UK) and broader healthcare costs, and specifically in terms of prioritising resources for patients with more urgent illnesses than to those who were asymptomatic with risk factors. Differences in perspectives among GPs were apparent, in part reflecting their region of practice, sociodemographics of their patient population and the use of an absolute CVD or individual risk factor approach. In studies conducted in New Zealand, the UK and Guatemala, GPs deliberated on the financial burden of screening in the general population for primary prevention and costs of medications incurred to their patients as well as their own practice. Some GPs who practised in low socioeconomic areas believed that advising lifestyle changes, particularly in terms of diet, were futile as they believed that patients had limited access to healthy food in their local area. In earlier studies, GPs expressed more hesitation about prescribing medications, when this was not yet common practice nor widely recommended for primary prevention.20 25 34 The majority of studies did not specify whether GPs used an absolute risk or individual risk factor approach to management, and did not detail the risk profile of their patients (ie, level of risk of CVD) when discussing preventive strategies. The concept of absolute risk was explicitly discussed in 17 (53%) studies, and these studies were focused on GPs perspectives on tools for assessing absolute risk for CVD prevention. Our study provides insights on the variability in decisions and approaches to CVD prevention among GPs. Approximately half of GPs use cardiovascular risk calculators and clinical guidelines,35 and those who do not use them have cited reasons including difficulties in using and interpreting the tools, and lack of applicability to their patient population in terms of age, socioeconomic background and family history. Our findings indicate that GPs may prefer to make their own judgement of individual risk factors acquired through experience rather than using absolute risk assessment tools. While a vast majority of GPs would recommend drug prescription where appropriate, this does not necessarily translate into rates of actual prescription. For example, a study in the UK found that only 42% of patients eligible for lipid lowering drugs were prescribed them.12 36 Our findings suggests that GPs’ decisions to prescribe medication can be influenced by their perception of how likely the patient is willing to commence the regimen and how likely they are to adhere to medications. Also, some GPs expressed reluctance to ‘medicalise’ unhealthy lifestyles and foster a false sense of security in patients through medication. A recent study found that more than half of GPs rated their ability to motivate behavioural change for CVD prevention as being ‘not good’, particularly for patients who were over 65, male or obese.37 Our findings indicate that GPs believe that it may be difficult to motivate change in patients with established lifestyle habits, particularly in older or obese patients, and need a more immediate solution such as medication. Our synthesis captured a broad range of the perspectives of GPs across different settings, and included attitudes pertaining to various CVD prevention strategies. However, there are some potential limitations. We were unable to differentiate whether GPs were using an absolute risk assessment or an individual risk factor approach, and whether perspectives were different in primary and secondary prevention, as these were not specified in most studies. Non-English articles were excluded, which could limit the transferability of the study’s findings. We were unable to assess the prevalence of each theme. Systematic reviews of qualitative studies are designed to describe the range and depth of perspectives, and cannot quantify the prevalence of themes. However, table 3 include references of the studies that contributed to each theme. GPs believed that empowering patients to prevent CVD through adherence to lifestyle and medications was needed, but found it challenging to motivate behavioural change. Some considered that clinical decision-making for CVD prevention involved the patients’ life stage and circumstances, capacity for self-management and their environment, which were not addressed in risk assessment and decision-making tools. Greater availability and adaptability of evidence-based strategies for assessing and managing CVD risk, including behavioural change in patients, may support decisions and implementation of CVD prevention activities among GPs. We thank all participants for sharing their interesting thoughts and perspectives for this study. WHO. Cardiovascular diseases (CVDs). 2016.
. The role of Australian primary health care in the prevention of chronic disease ADMA . 2012.
. Cardiovascular risk assessment in Australian general practice. Aust Fam Physician 2009;38:364–8.
. Physicians' attitudes towards cardiovascular guidelines and risk assessment tools: Relation with the management of risk factors in the primary prevention setting. Eur Heart J 2011;32:973. OECD. OECD Health Statistics 2016. Definitions, Sources and Methods. 2016.
. Why are there gaps in our management of those with high cardiovascular risk? J Prim Health Care 2012;4:21–9.
. A qualitative study of barriers to the use of statins and the implementation of coronary heart disease prevention in primary care. Br J Gen Pract 2003;53:684–9.
. The prevention of type 2 diabetes: general practitioner and practice nurse opinions. Br J Gen Pract 2004;54:531–5.
. ACC/AHA guideline on the assessment of cardiovascular risk: A report of the American College of Cardiology/American Heart Association Task Force on Practice Guidelines. 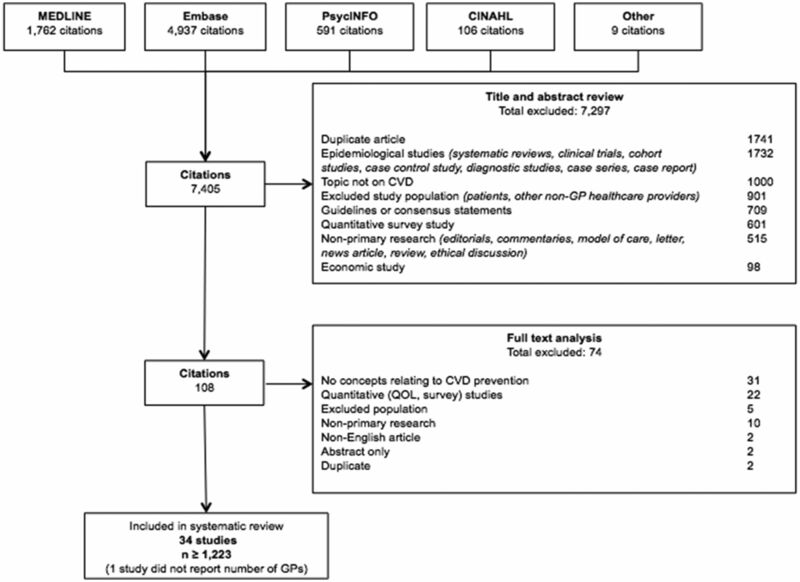 Circ 2013;129:S49–S73.
. European Guidelines on cardiovascular disease prevention in clinical practice. Eur Heart J 2016;2016:2315–81. WHO. Obesity: preventing and managing the Global Epidemic. 1998. Sebate E, WHO. Adherence to long-term therapies. Evidence for action: WHO, 2003. Alliance NVDP. Guidelines for the management of absolute cardiovascular risk, 2012.
. Cardiovascular disease in women. Pharm Self Assessment Program. 2010;1:179–99.
. GPs' views of absolute cardiovascular risk and its role in primary prevention. Aust Fam Physician 2005;34:503.
. Perspectives of general practitioners towards evaluation and treatment of cardiovascular diseases among older people. J Prim Health Care 2009;1:198–206. Contributors IJ participated in the design of the search strategy, conducted the search, screened the studies, carried out thematic analysis and drafted the manuscript. AT designed the search strategy, participated in the thematic analysis and was the primary reviewer for the manuscript. EB, BC, AJ, JA, RJK, TU, KM, CSH, and JCC provided a critical review of the manuscript and provided final approval of the version to be published. Funding The work was supported by a National Health and Medical Research Council of Australia Partnership Grant (1092674), including support from the National Heart Foundation of Australia. AT is supported by a NHMRC Fellowship (1106716).